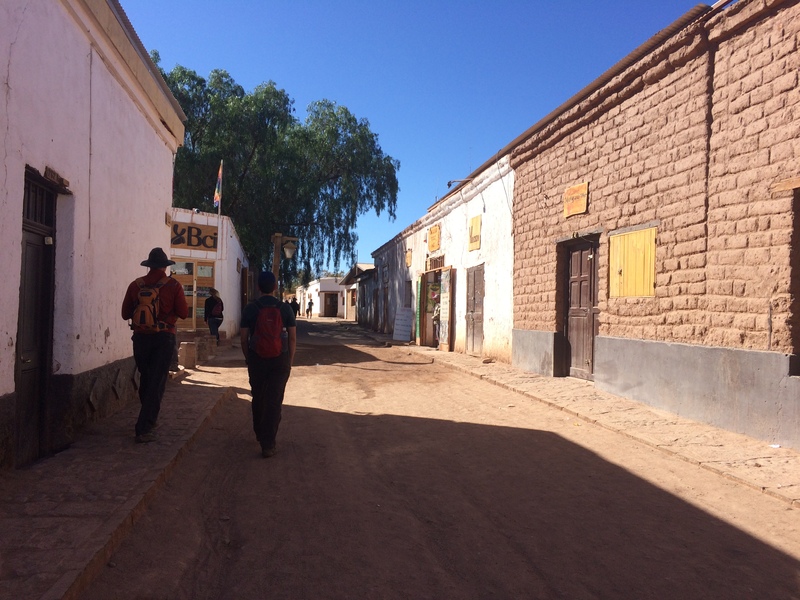 Going from one remote place to another wasn’t difficult; we had grown accustomed to marked up food, items, and lodging due to the necessity of hauling in products from major cities. 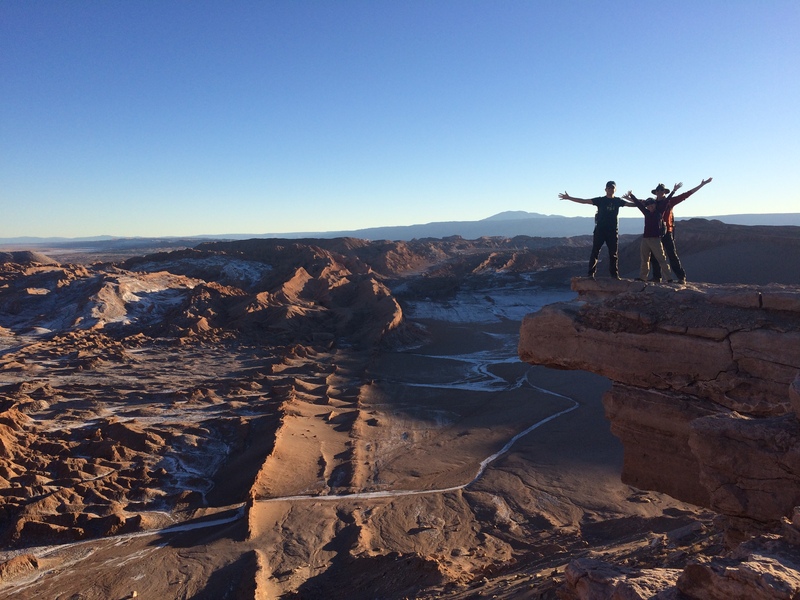 However the difference between Easter Island and San Pedro de Atacama was a major one. 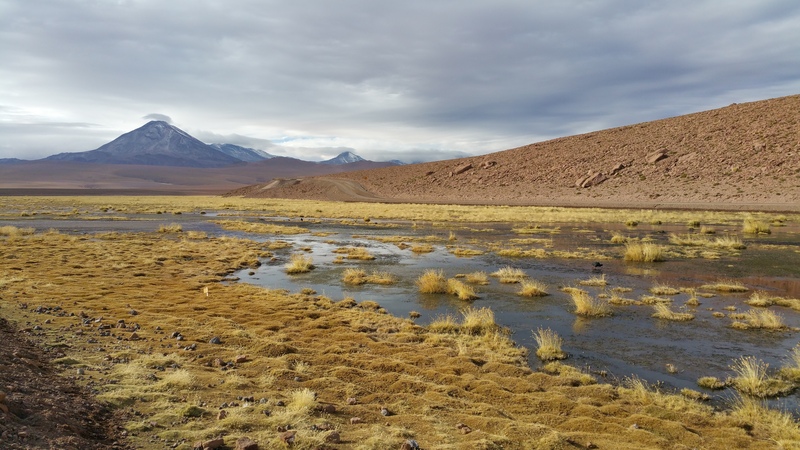 Albeit both of Chilean territory, one contained the warmth and relaxation of island life while the other boasted volcanoes and salt lagoons in high altitude deserts. Both territories are remote but each come with their own distinct, opposite reputation of beauty and wonder. 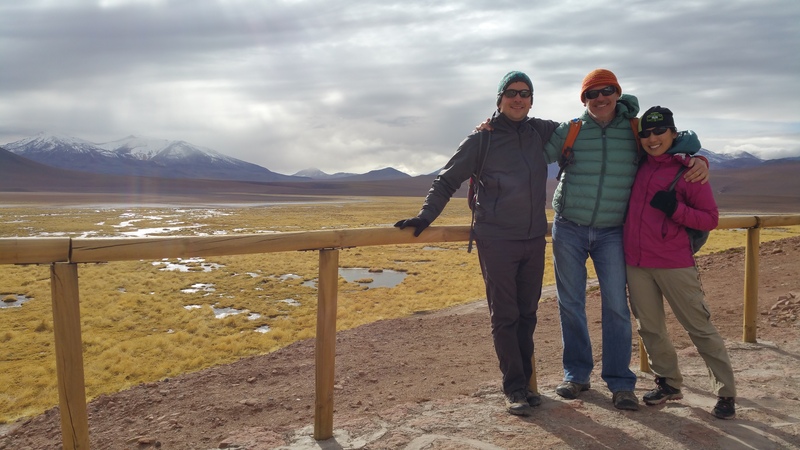 After returning from Easter Island, we spent two days in Santiago and packed away our warm-weather clothing to prepare for the cold deserts of Northern Chile. I didn’t know there was more to Easter Island than the moai statues, and I didn’t know there was more to San Pedro other than the famous Valley of the Moon. And like in Easter Island, I was amazed by the striking beauty and variety of excursions I had not known prior to arriving. 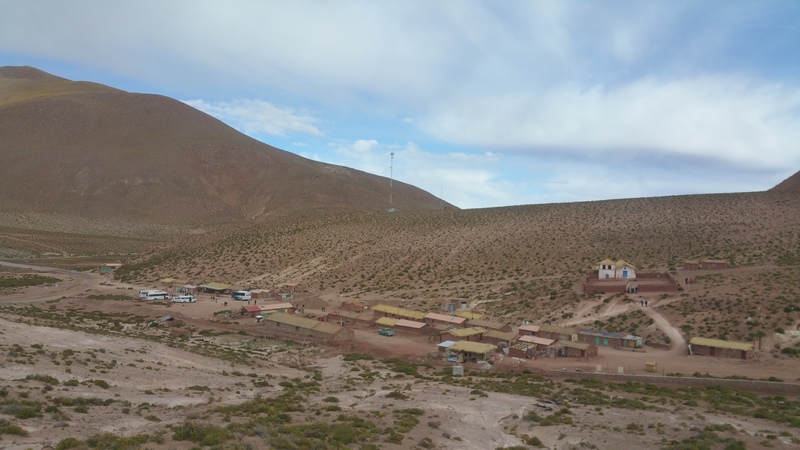 Situated ~7,000 feet above sea level, the vast desert of San Pedro faces drastic temperature changes between day and night. 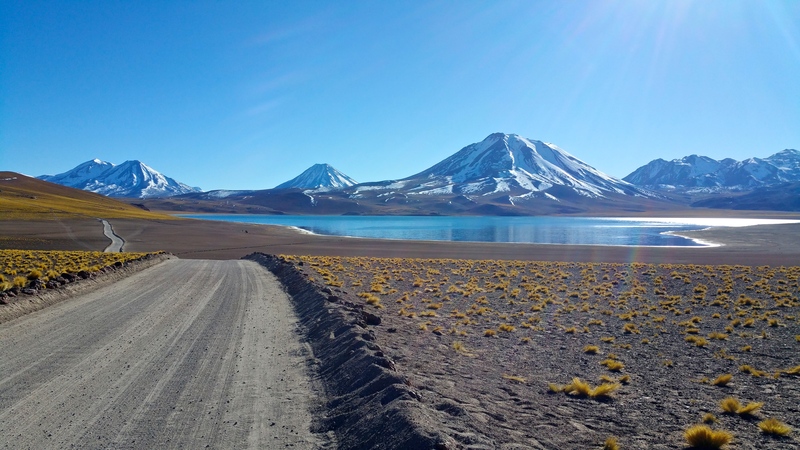 Imagine a desert valley surrounded by the most active volcanoes of Chile. Dust fills the roads, and each 4×4 or horse that passes by kicks up more dust into the air. During the day the high altitude UV rays penetrate the skin, easily frying pale skin within the hour. It is easy to forget about windburn…until your skin is cracked and chapped after a few hours of outdoor adventure. The incredibly dry air assures thirst in the morning, and perhaps even a bloody nose. 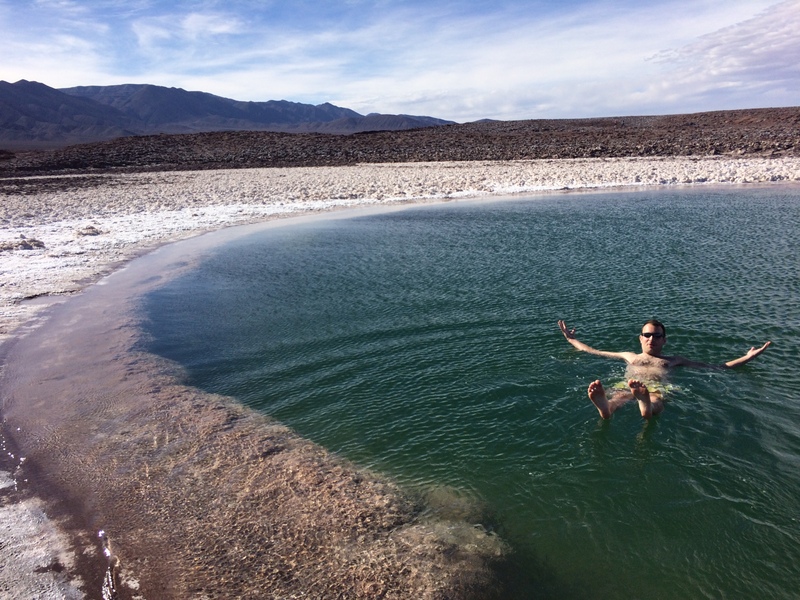 Add playtime in one of the salty lagoons, and your skin will wonder if it has ever suffered anything worse. When night falls, gloves, leggings, a jacket, and a hat are essential, but because the city lacks streetlights, stars shine galore. 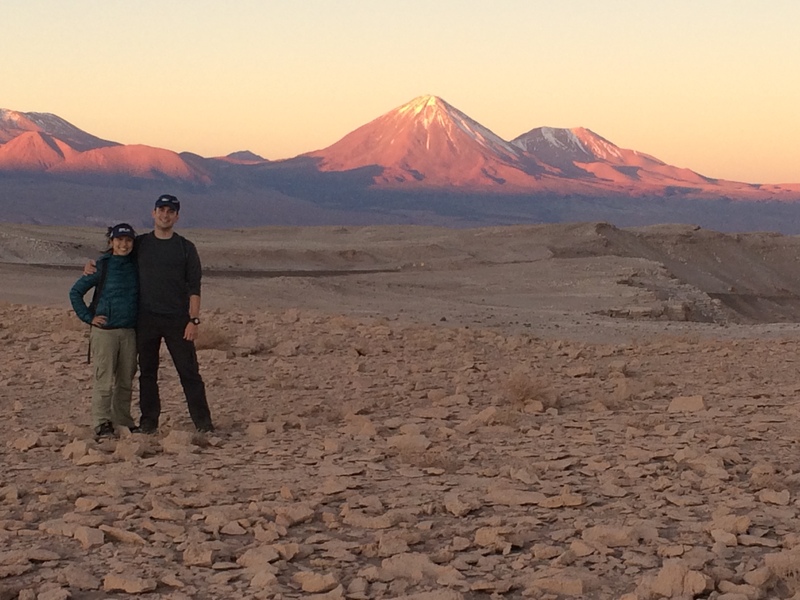 I’m amazed a town exists in such a location, but I appreciate its existence in order for foreigners to experience the epic beauty of the Atacama Desert. The streets of San Pedro are lined with 1-story stone buildings of tour companies offering practically the same excursions. We looked into renting a car for 4 days, but quick research showed that it would cost ~$700 USD! 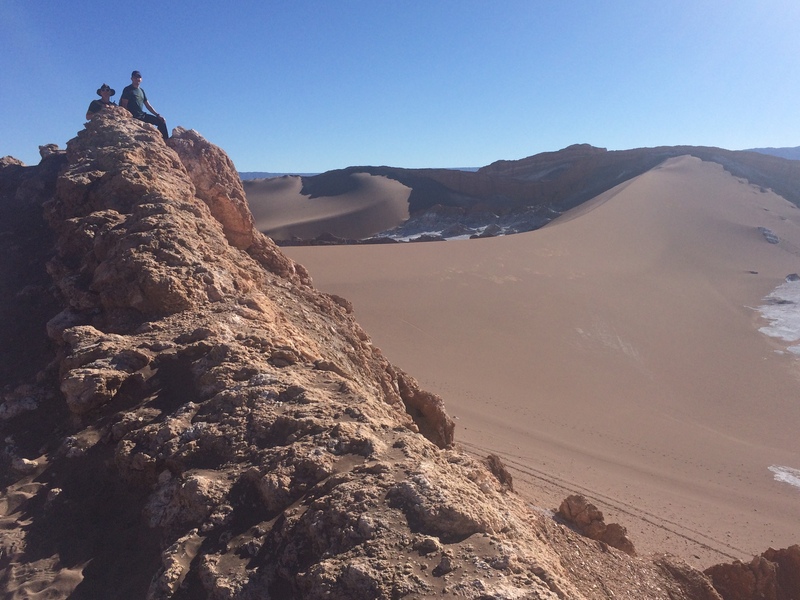 Unlike my experiences in tourist cities, it turned out that bus tours were definitely the easiest and most economical way of experiencing the Atacama Desert. So that’s what we did for our 4 whole days in San Pedro. 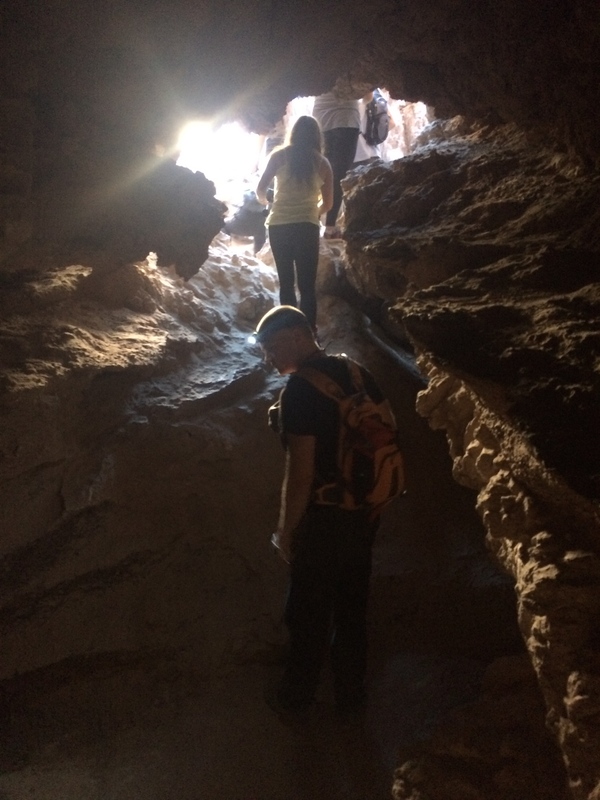 Below I have the costs associated with the tours and entrance fees, along with some photos and descriptions. 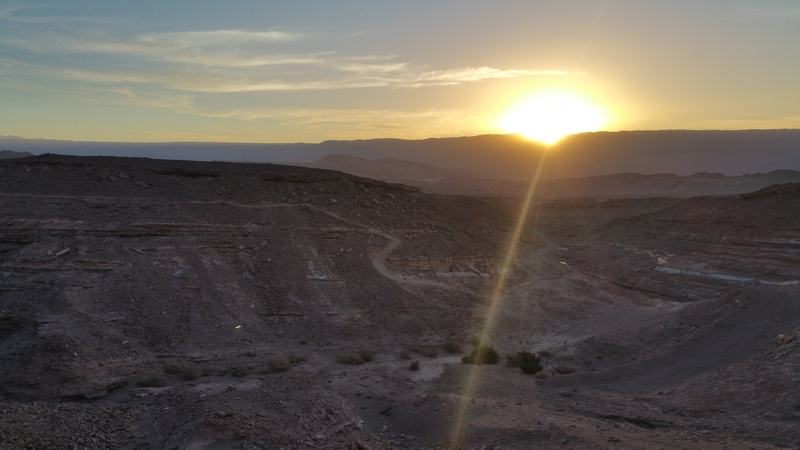 All tours to the Valley of the Moon start at 3pm and end with an epic sunset over the valley. This is the most recommended tour if you are short on time. 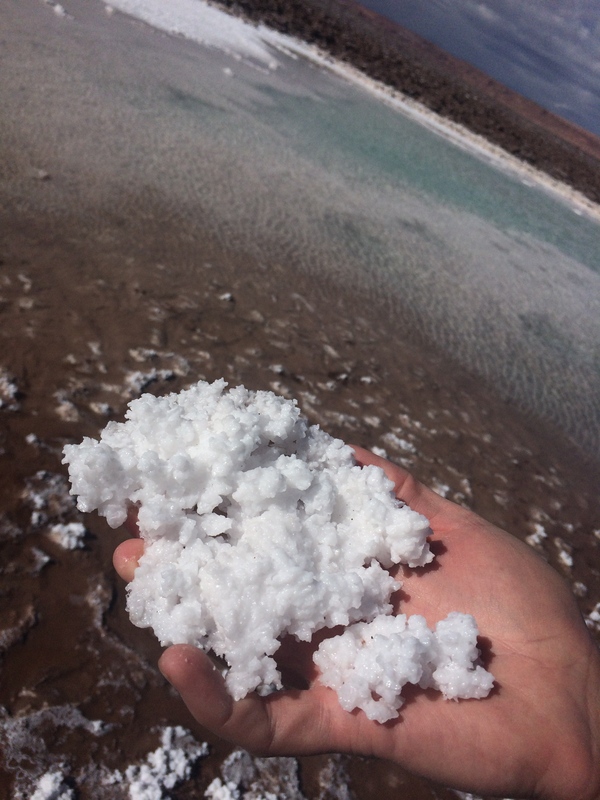 This place (and much of the desert) is covered in salt. 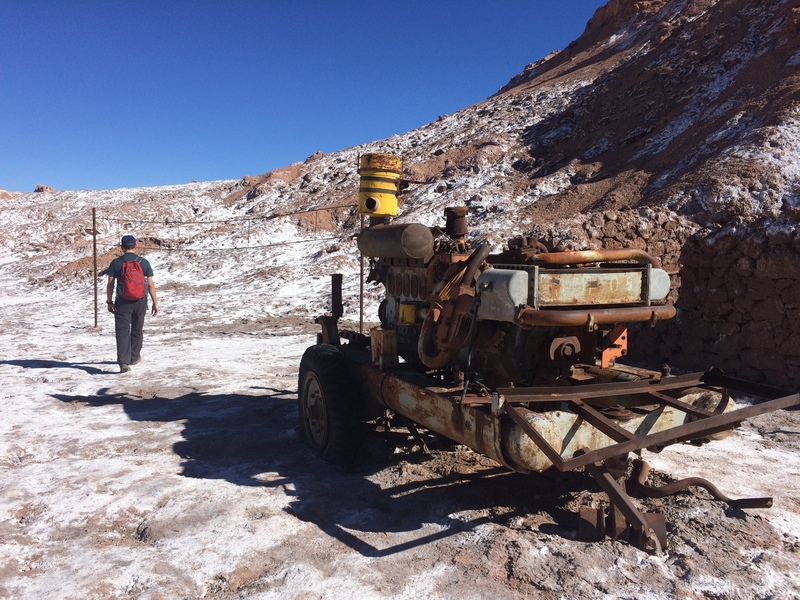 Back in the 60’s people even mined for salt here. 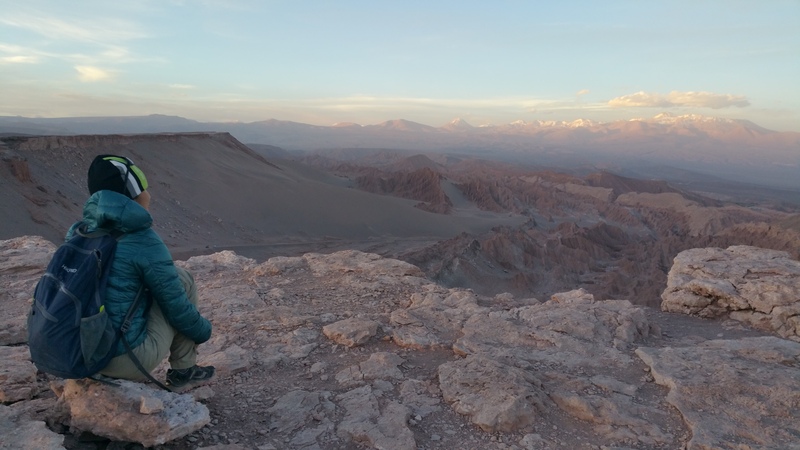 A short hike up a sandy hill revealed the gigantic salt valley and the Andes Mountains in the distance. The epic valley for sunset. 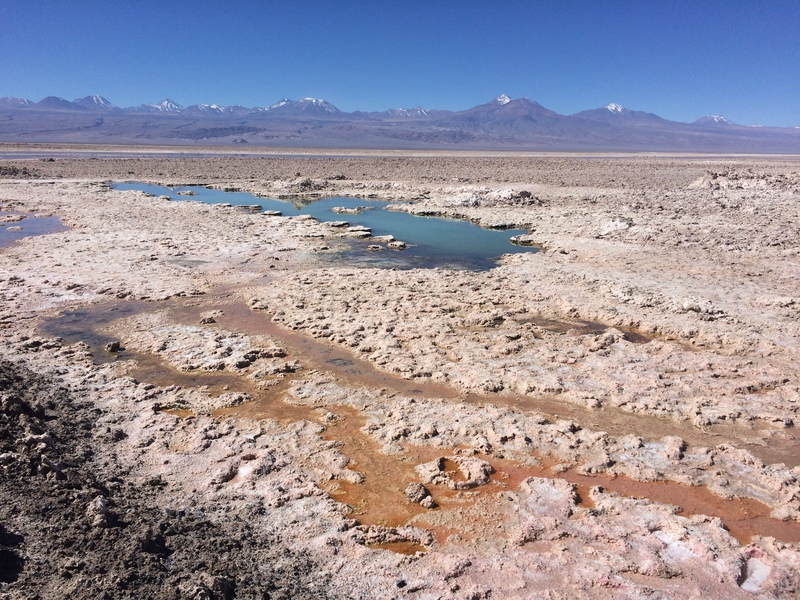 The morning after we visited the Valley of the Moon, we woke up bright and early to check out the Altiplano Lagoons Miscanti, Meñique, and Chaxa, which are a far distance south from San Pedro near the Bolivian border. 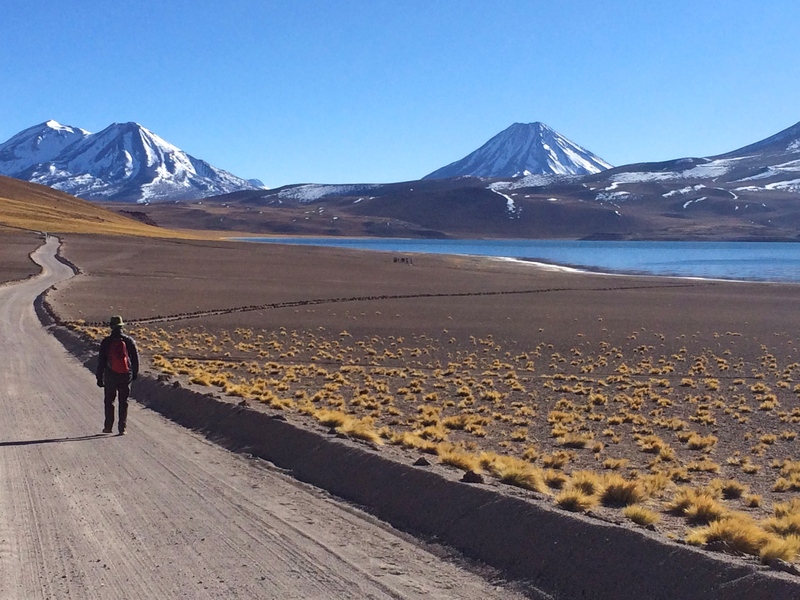 Despite the long, early bus ride and biting cold, the views of the salt lagoons with backdrops of volcanoes were breathtaking. 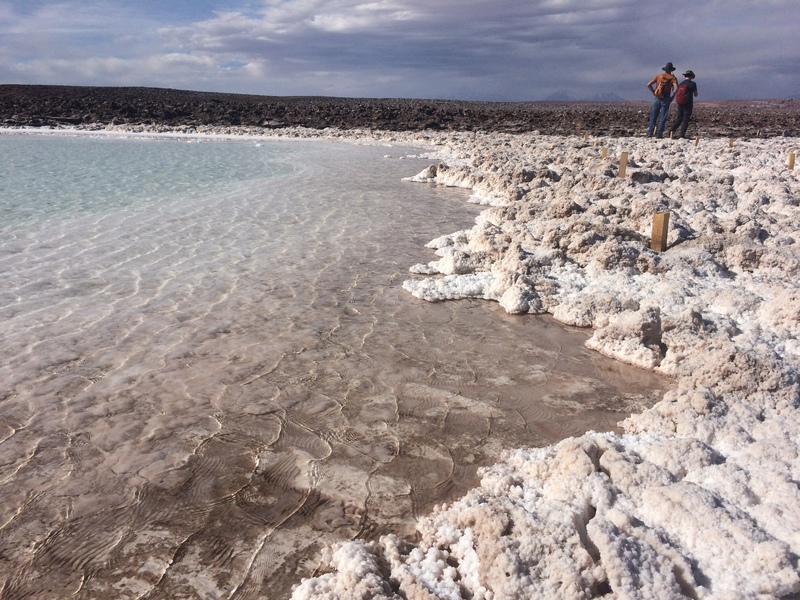 The Miscanti and Meñique Lagoons were part of the first park, with an entrance fee of 5,000 pesos pp (~$8). 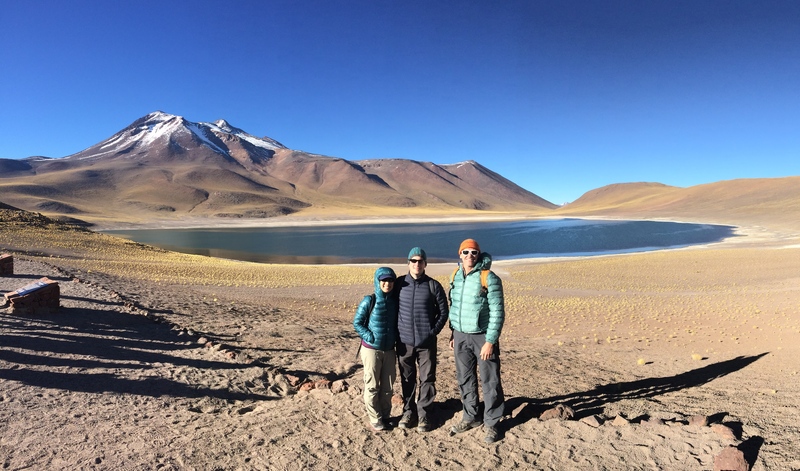 We were dropped off at Laguna Meñique. 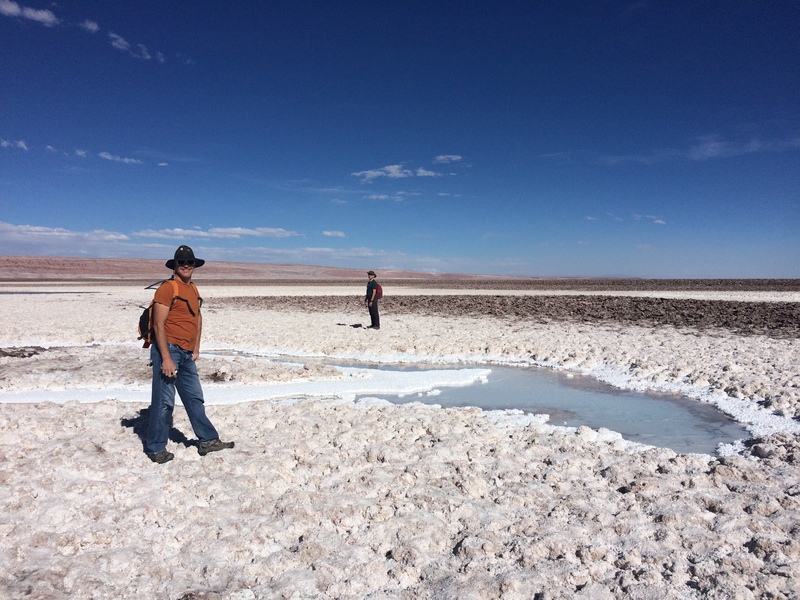 Then we strolled on over to Laguna Miscanti. After visiting these neighboring lagoons, we headed over to Laguna de Chaxa, a flamingo reserve, which also had another entrance fee of 5,000 pesos. This was by far our most expensive day in San Pedro! However, the natural beauty outweighed the expenses. 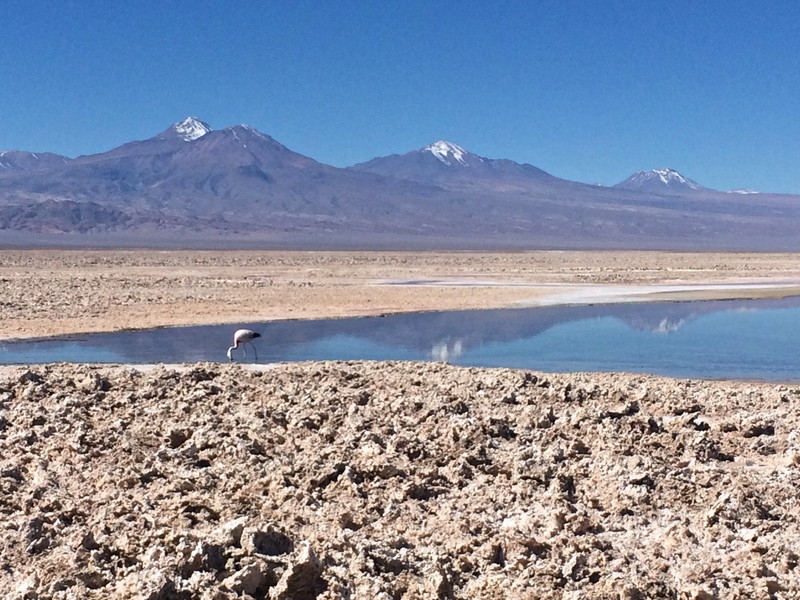 The tranquil salt lagoons, reflections of distant volcanoes, and wild flamingoes were stunning. We wished we could have had more time there. We had already seen the largest geyser field in the world at Yellowstone, but it wouldn’t hurt to see the 3rd largest geyser field in the world. 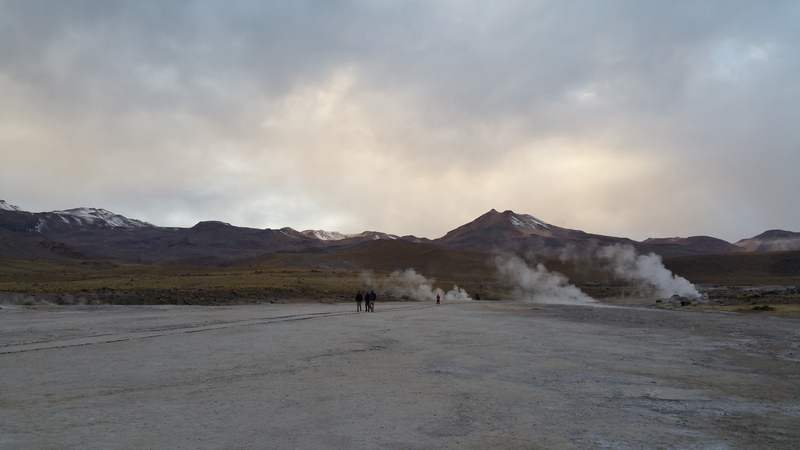 The Geyser of Tatio also boasts the reputation of being the highest geyser field in the world. Although not spectacular by any means, we still enjoyed waking up at 4am for the long drive north of San Pedro in order to catch the geysers at sunrise. 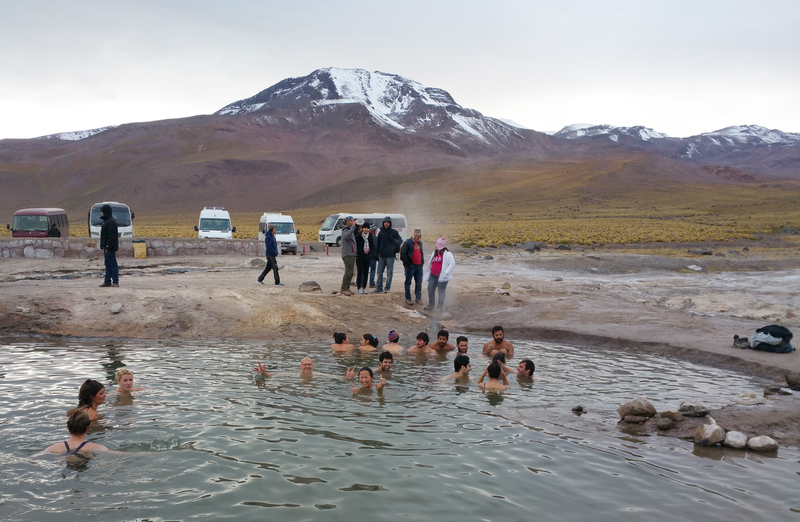 Our favorite excursion at the geysers was soaking in a “hot” geyser pool in below freezing air temperatures. In actuality it was far from hot…it was only slightly warm at best and seemingly cold due to the air temp. But whatever. It was fun. On our return to San Pedro, we stopped to snap pictures of the beautiful fauna. 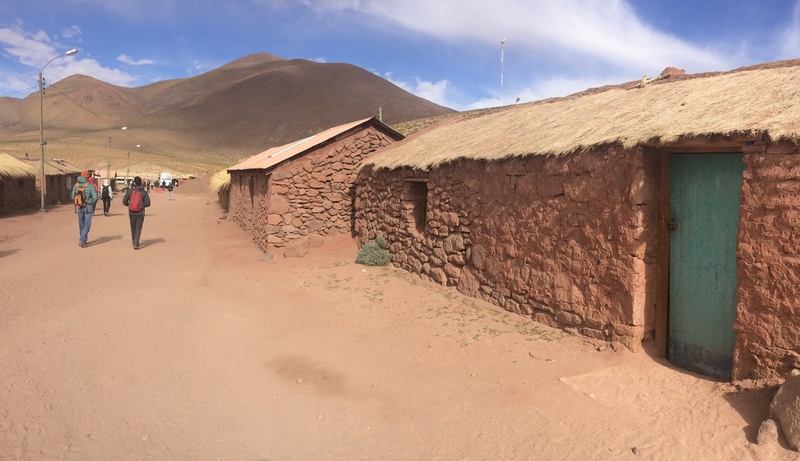 We also made a brief visit to a tiny pueblo called Machuca. 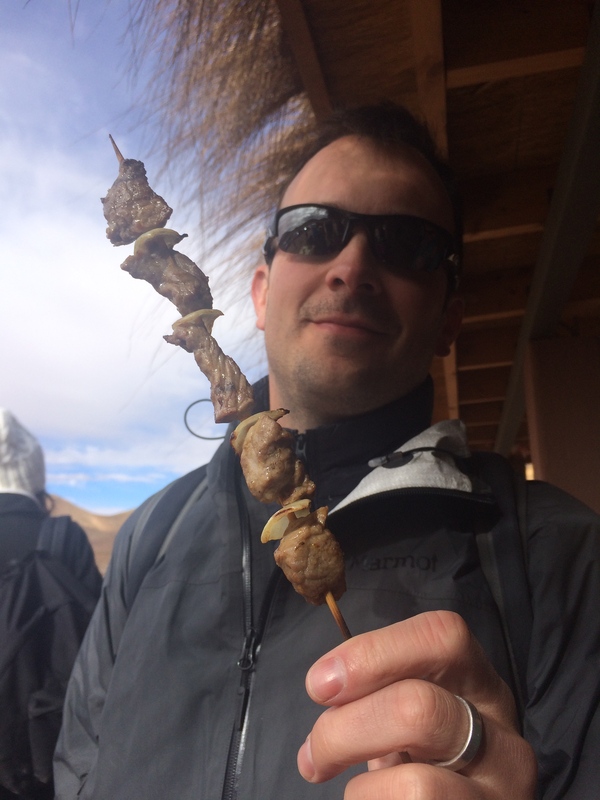 There, we had our first taste of llama, grilled and skewered. It was delicious! We can’t wait to eat more llama in Peru. Chris has mentioned wanting to float in the salty waters of the Dead Sea. I have never had such a desire. 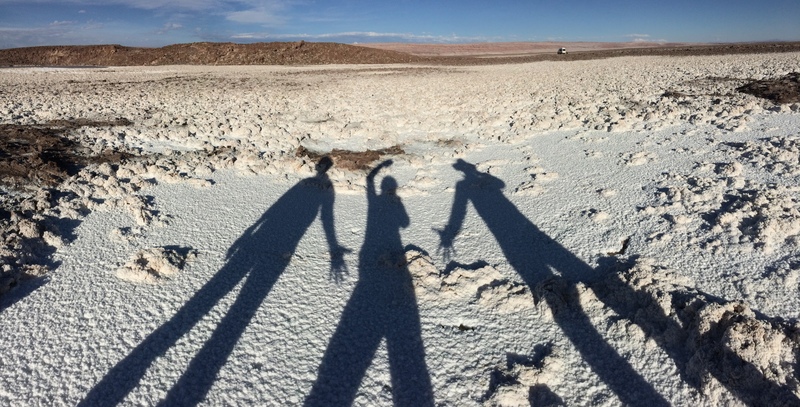 However Karl, Chris, and I ended up entering this salty lagoon outside of San Pedro. We didn’t care that the winds were strong that day. 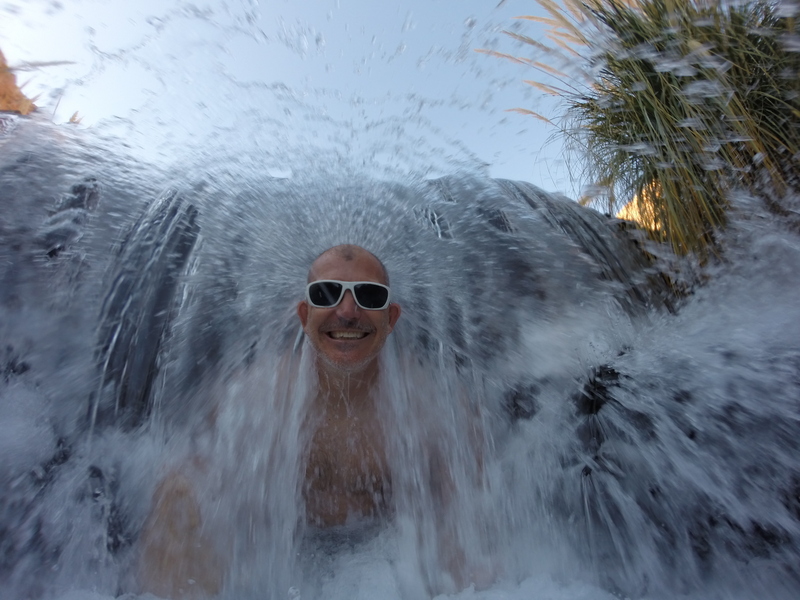 The air temp also wasn’t favorable, and the water was COLD. Practically no one else desired to go in. Despite the chilly autumn weather, we went in anyway. And it was incredible. The feeling of such strong buoyancy was one of the coolest things we have ever experienced. The best way to describe the feeling is like…sitting on a ball. 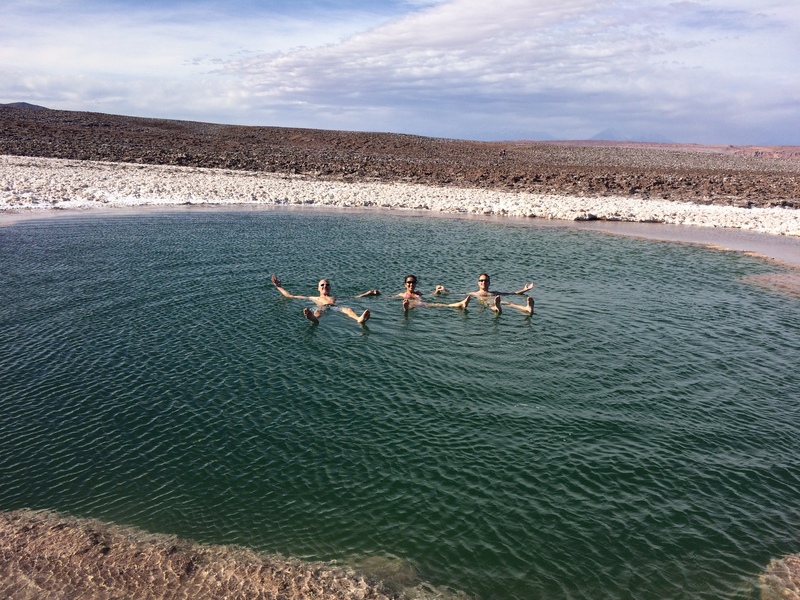 Even if you do not wish to float in the frigid lagoon, you can still enjoy the surroundings. 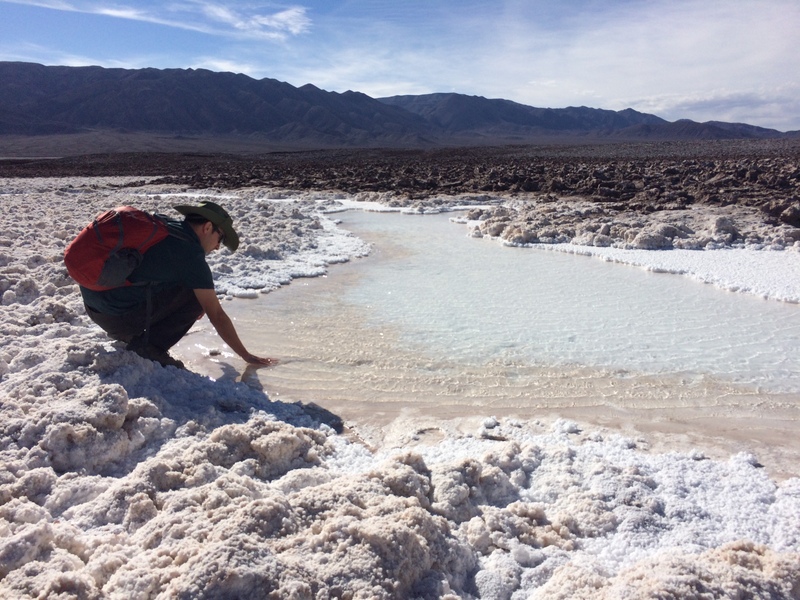 There are multiple lagoons with short hikes showcasing the interesting salt clusters and formations in the area. We enjoyed feeling the silky texture of super salty water. 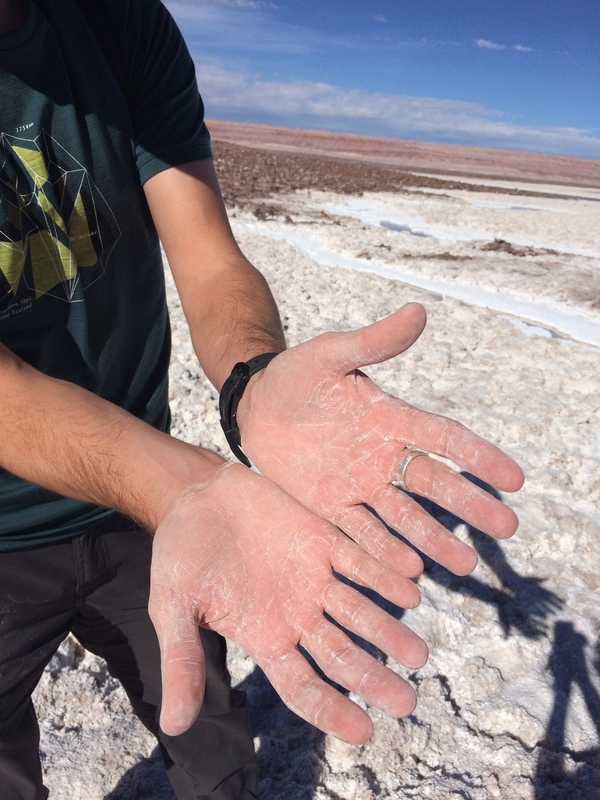 And then we observed the salt that remained in our hands after the water evaporated. 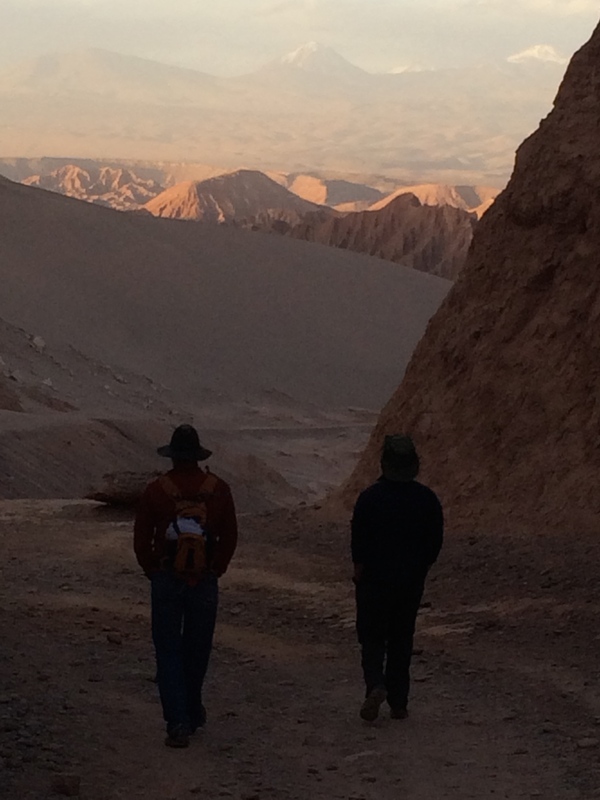 After we left the lagoon, we finished the tour with a sunset over the “amphitheater” of the Valley of the Moon. 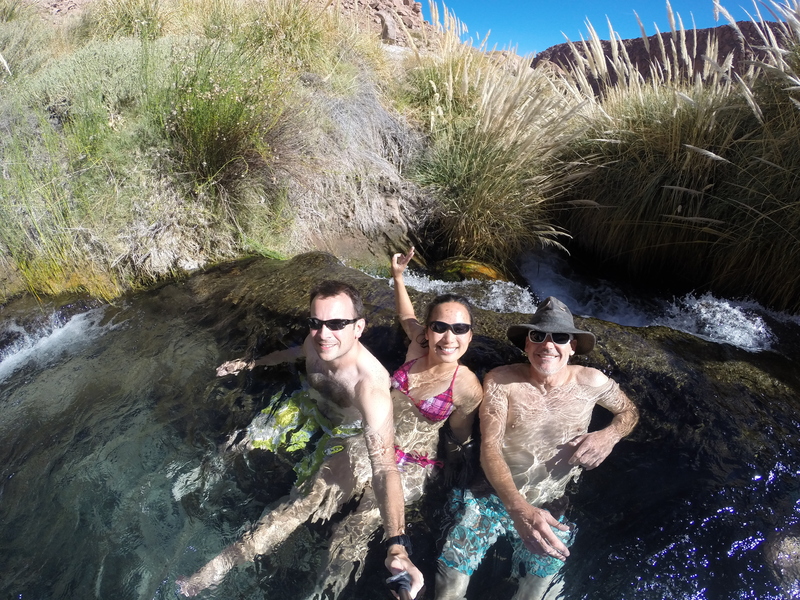 We finished our visit in San Pedro with a relaxing day at the “hot springs” of Puritama. 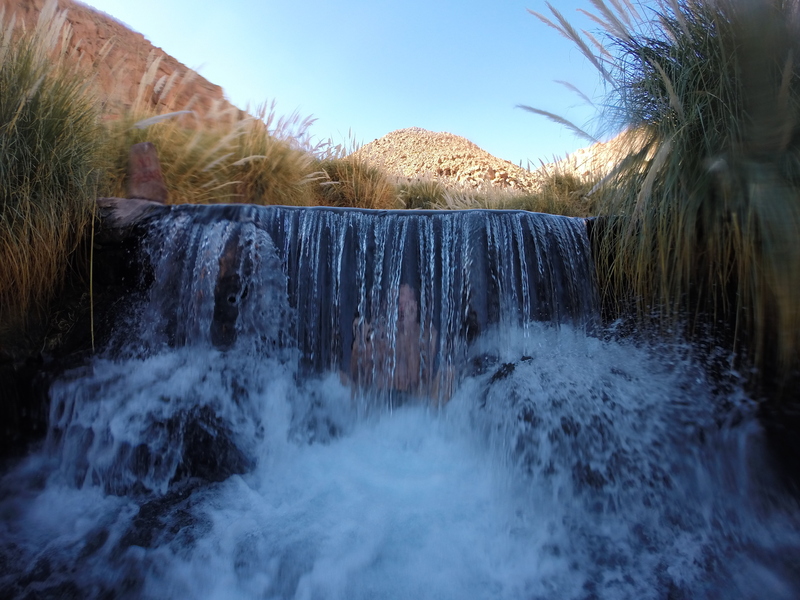 There are about 10 artificial warm pools and waterfalls that belong to a resort; the pools are created from a warm-water natural river nearby. Tip: The entrance fee is a steep 15,000 pesos before 2pm, but after 2pm it is only 9000 pesos pp. Bring a padlock—there are lockers available! Our favorite warm pool had a hidden waterfall that one could sit behind. No words can explain how much we enjoyed climbing into the waterfall and bursting out of it. Karl’s 2-week vacation in Chile finally drew to a close, and we bid farewell to him the next morning. 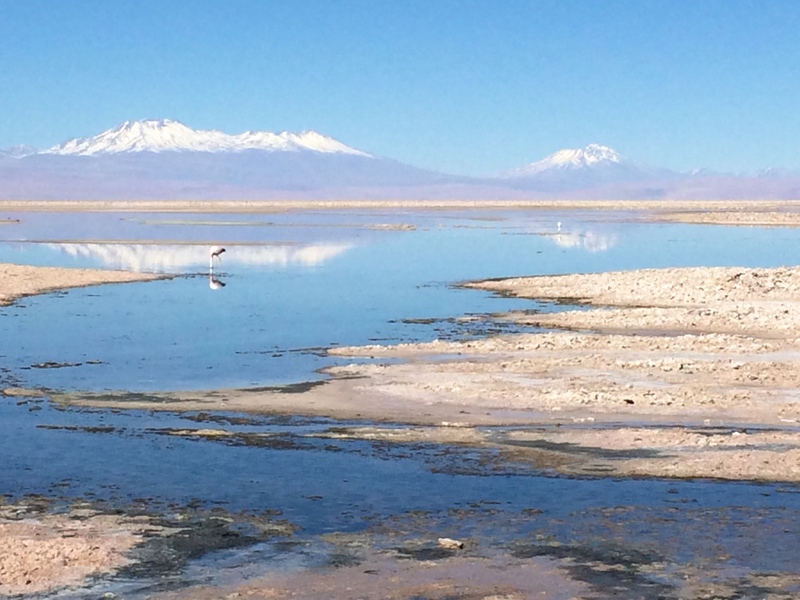 As he headed back to the States, we continued our journey to an incredible 4-day, 3-night off-roading adventure in Southern Bolivia to spectate even more gorgeous high plain salt lagoons, volcanoes, flamingos, and finally, the largest salt flats in the world. 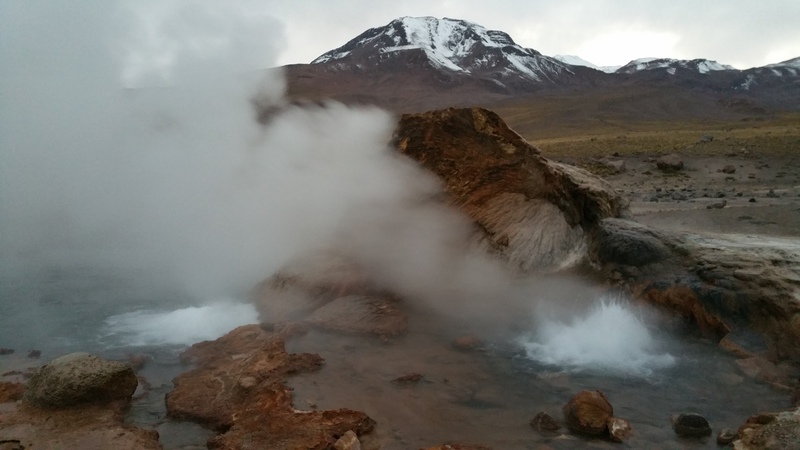 This entry was posted in Chile and tagged geyser del tatio, laguna cejar, lagunas altiplanicas, termas de puritama, valle de la luna. Bookmark the permalink.